King tides are predictable and can be planned for by looking at a tide table. The term "King Tide" is a non-scientific term used to describe Perigean Spring Tides which are the highest seasonal tides that occur each year. These tides occur when the moon is either new or full and is closest to the earth in its monthly orbit. These especially high tides can cause or worsen coastal flooding. The average high tide in Charleston is about 5.5 ft., whereas during a King or Spring Tide event the high tide may reach 7 ft. or higher (MHHW). 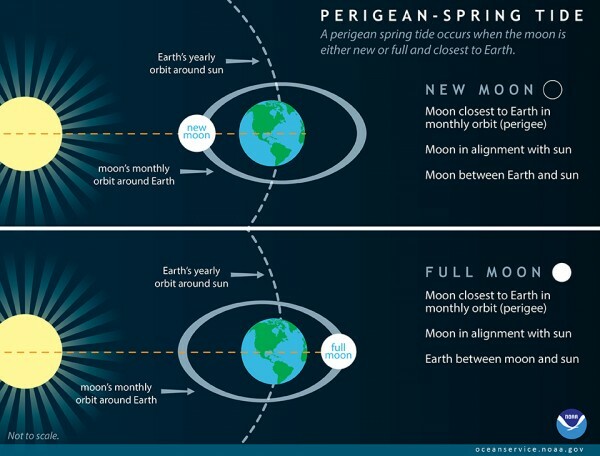 In order to understand Perigean Spring Tides, you first have to know that the gravitational pull of the moon and the sun cause tides. Tides are actually long-period waves that roll around the planet as the ocean is 'pulled' back and forth as the moon and the sun interact with the Earth in their monthly and yearly orbits. The next thing you need to know is that the moon follows an elliptical path around the Earth in its monthly orbit, and the Earth follows an elliptical path in its yearly orbit around the sun. This means that, at times, the moon and the sun are closer to Earth. At other times, they are farther away. What happens when the moon and the sun are close to the Earth? You guessed it: the gravitational pull they exert is stronger, resulting in slightly higher tides. While both the moon and the sun influence tides, the moon plays a much larger role because it is so close to the Earth. Its gravitational pull is about twice as strong as that of the sun. LEARN MORE about tides (NOAA NWS). VIEW activity at the Charleston Harbor Tide Gauge (NOAA NWS). VIEW tide tables to see predicted high tides and king tides in advance (SC DHEC). Major coastal flooding doesn't always occur whenever there is a Perigean Spring Tide, however these tides may often cause minor coastal flooding. Major coastal flooding typically occurs in response to strong onshore winds and barometric pressure changes from a coastal storm. If a storm strikes during a Perigean Spring Tide, flooding could be significantly worse than it otherwise would have been. In some instances, Perigean Spring Tides have coincided with a shift in offshore ocean circulation patterns and large scale shifts in wind that have resulted in unexpected coastal flooding. It is expected that occurrences of minor coastal flooding at the times of Perigean Spring Tides will increase even more as sea level rises relative to the land.